We developed a new module called Import Stats that can be found under Insane Import module. If you have a fresh install, you don’t need to do anything. Simply import products, and you will begin to see statistics on the imported products right away. 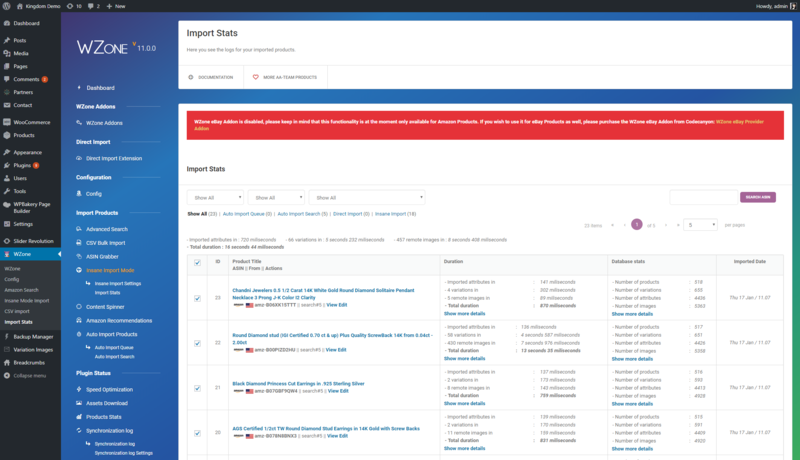 You can also see statistics on products imported with the Insane Mode, Auto Import Module and the Direct Import module. The purpose of the Import Stats module is to see how much it takes to import a product from amazon into your website. Also to see if your website is starting to slow down after importing too many products, mainly to see what’s your server limit when comes to importing products from Amazon. The ideal duration of a product import is a few hundred miliseconds. If that product has many variations (over 50) it can even take a few seconds. But if your server resources are limited and the import of a simple product takes too long, you should consider upgrading your hosting plan.